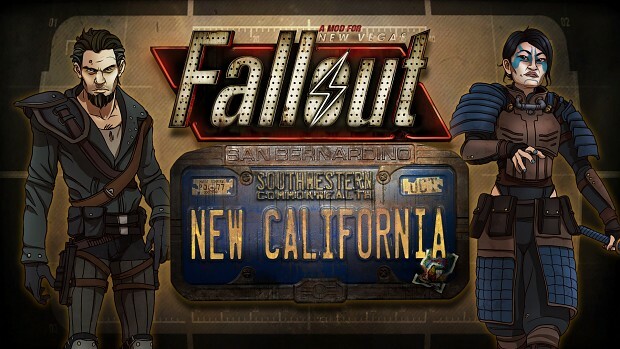 Fallout: New California - BETA is out! Discussion in 'NMA News and Information' started by Proletären, Oct 23, 2018. Proletären Where'd That 6th Toe Come From? After years of development the beta of anticipated New Vegas mod Fallout: New Californa (previously Project Brazil) is finally out! You can read all about it in this post. Could it be as good as other recent TC:s like the great Fallout 1.5: Resurrection and Fallout Nevada? What's great is that the story takes place between Fallout 2 and New Vegas, bridging the gap. What's not so great is that Fallout New California also takes the lore of "Fallout 3" into account. Why you would ever want to do that is beyond my understanding. To me that is shooting yourself in the foot since it can only make your own game worse. A fan of Fallout would of course disregard anything to do with Bethesdas games. Anyway, I suggest you play it. Post your impressions here and don't forget to give some valuable feedback from the NMA community to the developers so that they can refine the mod before release of 1.0 proper. What's not so great is that Fallout New California also takes the lore of Fallout 3 into account. This is an huge turn off honestly. New Vegas also kind of took it into account but made fun of it mostly. If the connection to that abomination in anyway makes the story of this mod stupid, we must convey that information to the developers so that they can correct it before release of 1.0. I do hope that this is good but from all trailers I have seen the writing doesn't look so good. The fact that it is another gamebryo shite is what turns me off. Saw a video, lipsyncing looks like arse. Is this the TC mod that fucks with the RPG mechanics too? Cause if so I think I've tried a demo of it before and I did not like it. The guy I saw talking also said something about Raven Rock so yeah, FO3 references. I might be desperate for Fallout content but I'm not 'that' desperate. If I'm going to torture myself with the gamebryo engine then I'll do it to FNV and not a TC mod. The weird 'tribal adopted turned football player' angle seems a bit strange and the Vault intro does seem like a heavy call back to F3's intro, but I'm a little interested to see how it plays if nothing else. Since it does seems like they did want to have some sort of choice. Worst that happens is I don't enjoy it and remove the mod, seeing as its free. Although reading about it a bit more and some of those choices are strange and binary - the first one 'Tackle' or 'Dodge' seems really weird to me as I'm not sure a player's stats have any impact on the path there but I'm at least forewarned and forearmed. Since it's now confirmed that Fallout is dead all we have bringing the series forward are TC:s.
If you like the *idea* of Fallout 3, you're good. You won't care, trust me. We stuck real close to F1 and F2, but the respect for the IP owners and New Vegas is obviously still there. Soon we will have an underground Total Conversion Fallout movement. I mean we have it already. Bethesda can keep milking this (dead in our eyes) franchise, it will sway some reasonable people to our side. Not many, but some. The term ''Fallout fan'' doesn't mean anything to me. And we here, on NMA, are not even considered normal by F3 and F4 fans and every time they use the word ''nostalgia'' I just sigh. Why some people can't understand we prefer RPGs over poorly written FPS? So TC as a future of the Fallout series is not a bad vision for me. I'm stoked for this TC. A return to California in a 3d Fallout game is a dream come true. Although i wish these modders would just make their own isometric fallout games instead of using the duct-tape tower that is gamebryo. My first impression is that FNC is a better version of fallout 3. Why would you need a Vault tutorial level again? In the other hand, Union city is very good. Still, Enclave is very annoying in this game. Even 4out knew that it's a bad idea to bring it back. What is the best mod manager for this? I haven't tried it yet, but I doubt FOMM will have any problem with it. If you know what you're doing MO2 should be fine with it too. clone of the player character from F1 and he/she is also the Courier from New Vegas. This is extremely stupid. And apparently the story is pretty bad with a lot of continuity issues like the Shi being japanese, even though they are chinese. Not to mention using the Enclave, the same mistake Fallout 3 made. Yeah, this mod looks pretty damn bad. I'll just play New Vegas if i want to deal with Gamebryo. Jesus that sounds so stupid. I knew this mod would be poorly written fanfiction since I have first seen it and heard the terrible writing. There are many things I just don't like about this mod like giving you a backstory like fallout 3 and 4 did. I really hope fallout cascadia is better. I have to ask: what exactly is wrong with the mod using the Enclave in the way it does? I think that based on how New Vegas and Van Buren treated the subject matter, Enclave holdouts do make sense in the way that they're being portrayed as scattered and fighting with guerrilla tactics, or otherwise trying (and failing) to integrate with the NCR. It's much better than how Fallout 3 depicts a mass migration directed by a ZAX out of the blue. Because to me it feels contrived that the faction is somehow still alive when it was destroyed in Fallout 2 and whatever remains it had were crushed by the NCR and BoS. It feels as forced as BoS just popping in other place because apparently they had a bunker there too or something similar. New Vegas had the right idea of just having an handful of remnants. It's not the faction somehow still alive or a sizeable amount of soldiers trying to make it into a big thing again, it's just an handful of survivors that escaped the NCR and BoS and no longer care about the Enclave. And how about a new faction instead? New factions are much more interesting to me because you get to know a new group of people. I do have to say that being able to join them is cool and it's something Fallout 3 should have allowed you to. Of course you can't in that game because you have to be Jesus in the end. But then as you go on to say, "New Vegas had the right idea of just having an handful of remnants. It's not the faction somehow still alive or a sizeable amount of soldiers trying to make it into a big thing again, it's just an handful of survivors that escaped the NCR and BoS and no longer care about the Enclave." If the Oil Rig is destroyed in 2242 and Navarro shortly afterwards, and 40 years later there's only a handful of Enclave left in a region that the Enclave were not really active in to begin, would it not stand to reason that a somewhat larger group of Enclave would be around 20 years prior in the Core Region where they were prominent? All I'm seeing is that New California is filling in the line of progression between FO2 and FONV. I do agree with you that new factions are usually preferable. I'm interested to learn more about New California's new faction the Raider Alliance, although personally I think they could have gotten more creative with the name. I have to ask: what exactly is wrong with the mod using the Enclave in the way it does? FNV is okay that Enclave can be ignored easily. In Fallout 3, Enclave only appears in the latter part of the main quest, so you can still ignore it if you ignore the main quest. The bad news is: You can't ignore Enlave in FNC. It's there at the very beginning to the end. Well the Enclave were active around California. But a clone of the Fallout 1 guy? WTF is that?